This is a critical issue, one that is central to our current economic crisis and the debt that has saturated our society… so please forgive the length of this article, I hope you will take the time to read and understand what’s happening with the unregulated and untracked shadow banking world of financial engineering, profiteering, and looting. The total notional value of derivates that they track appears to have continued going up, but in fact have been going down recently. 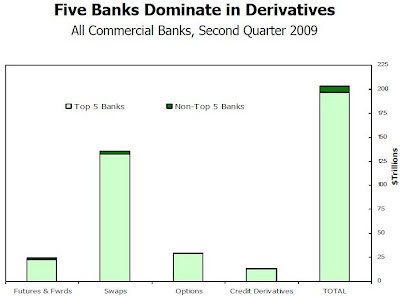 The reason they report total derivatives still going up is that several key big companies, formerly Investment Banks, filed to become Commercial Banks so that they can receive government handouts like the rest of the Commercial Banks. The largest of these is Goldman Sachs. • The notional value of derivatives held by U.S. commercial banks increased $1.5 trillion in the second quarter, or 0.7%, to $203.5 trillion. 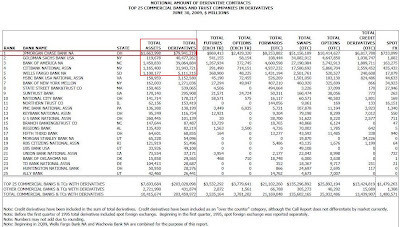 • U.S. commercial banks reported revenues of $5.2 billion trading cash and derivative instruments in the second quarter of 2009, compared to a record $9.8 billion in the first quarter. • Net current credit exposure decreased 20% to $555 billion. • Derivative contracts remain concentrated in interest rate products, which comprise 85% of total derivative notional values. The notional value of credit derivative contracts decreased by 8% during the quarter to $13.4 trillion. Note that bullet one says the notional value increased by $1.5 trillion… in Q4 of ’08 they increased by $24.5 Trillion mainly due to the previously mentioned IB’s becoming CB’s, but take that effect away and you would have net negative derivative growth as you are seeing in the remainder of the bullets with revenues cut nearly in half, net current credit exposure decreased 20%, and credit derivatives decreased 8%. Do you see those decreases in the monetary aggregates reported by the Fed? No? That’s because their monetary aggregates do not capture the entirety of the shadow banking system, they only capture a portion of it indirectly when credit dollars are deposited in institutions. Leverage is dramatically increased as derivative contracts (most with no real backing – as in no real ability to pay) as companies pretend that their positions are backed or hedged – in most cases a catastrophic loss could not be paid, that is exactly what happened with the collapse of AIG and why the Government stepped in to bail out the central banks. And the central banks, the Primary Dealers (WFC is not a P.D. ), DOMINATE the world of derivatives. Remember, these are the banks WHO ARE THE FED. They are the ones who influence the Treasury and politicians to get their rules made into law (using phony money they created from thin air). Credit derivatives grew rapidly over the past several years as dealers increasingly used them to structure securities to help meet investor demand for higher yields. From year-end 2003 to 2008, credit derivative contracts grew at a 100% compounded annual growth rate. 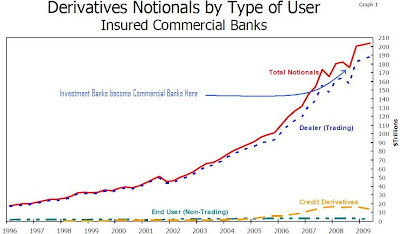 However, notional credit derivatives volume has fallen $2.5 trillion, or 15.5%, since peaking at $15.9 trillion in the fourth quarter of 2008. One hundred percent compounding rate of interest? Ha, ha, that’s a double every single year. Think that’s sustainable? It’s not. Again, note that derivative VOLUME peaked in ’08 and is now down 15.5% in less than a year. Note that JPM was #1 with nearly $92 Trillion in notional derivative value, more than 65 times their then (market to fantasy) total assets of $1.4 Trillion! Today their fantasy assets total a little more than $2.0 Trillion (down from $2.2 Trillion, Q3 of ‘08), and yet their notional derivatives have fallen to ONLY $80 Trillion, or ONLY 40 times their marked to fantasy assets! That’s a huge deleveraging, on the order of 13% in terms of notional value, but a whopping 38.5% in terms of leverage. 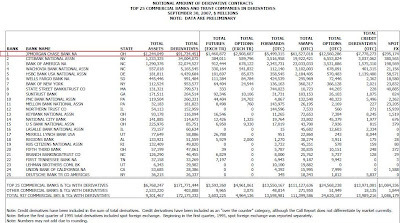 Now take a look at the composition of the top 5 again… you’ll find Goldman at #2 with $40 billion where they were not on the list at all before. Next up is Bank of America who has grown their derivative portfolio not by taking on more derivatives positions, but rather by acquiring other companies. Then there’s Citi whose derivatives portfolio has shrunk by over $2 Trillion, but despite nearly going the way of the Dodo bird in-between, their deleveraging has not progressed along the lines of JPM or GS, the two most highly leveraged large companies in the history of the planet. In 2007, Citi was running a paltry 15.5 to 1 ratio compared to JPM’s 65 and today is down to about 16.8 to 1 (comparing OCC derivatives to latest balance sheet assets). Although Citi’s notional derivatives value has declined, their marked to fantasy assets have declined faster, falling from $2.2 to $1.9 Trillion. That's some range of derivatives to assets... I'd say that JPM and GS are in a "special" class of their own. So, the shadow banking system has actually been shrinking more than is known or acknowledged by most. In JPM’s case, I think this is intentional. The truth, however, is that there are very few legitimate purposes for these derivatives other than to find new ways to charge fees and to increase “credit,” that, of course, being someone else’s debt. And speaking of fees, they have found a new game to send fees and commissions into the stratosphere, it’s called “Cap & Trade.” Goldman, in particular, has placed themselves at the head of a new market, one that will be larger than even the currency markets and they will skim transaction fees every step of the way (shhhh, Cap & Trade is really just another derivative market, shhhh!). Of course this is sold as being good for the environment! LOL, what bunk! It’ll be good for Goldman and more expensive for everybody else. This same lie is told about derivatives in general, some even claim that derivatives makes things less expensive! What baloney, they DRASTICALLY increase overall costs and ADD RISK to the system, they certainly do not lessen it. Oct. 9 (Bloomberg) -- As President Barack Obama vowed in a Sept. 14 speech in New York’s Federal Hall to correct “reckless behavior and unchecked excess” on Wall Street, Mike McMahon and Barney Frank sat in the audience discussing how to ease proposed rules for the $592 trillion over-the-counter derivatives market. Side by side at 26 Wall St., across from the New York Stock Exchange, freshman congressman McMahon told House Financial Services Committee Chairman Frank he was worried that Obama’s derivatives plan, released in August, would penalize a wide swath of U.S. corporations and could push jobs in his home district overseas, McMahon said in an interview. It’s not just end-users who won concessions from McMahon and Frank. JPMorgan Chase & Co.,Goldman Sachs Group Inc. and Credit Suisse Group AG lobbied McMahon and fellow New Democrat Coalition member Representative Melissa Bean of Illinois, among others, to expand the ways the legislation allows dealers and major investors to trade the contracts, according to people familiar with the matter. Bean’s spokesman Jonathan Lipman rejected the notion that the New Democrats made any changes to the bill at the behest of banks. JPMorgan spokesman Justin Perras, Goldman Sachs spokesman Michael DuVally and Credit Suisse spokeswoman Victoria Harmon declined to comment. The battle over derivatives legislation is a test for the Obama administration’s efforts to tighten financial regulation to prevent a repeat of the financial crisis that shook the global economy -- a crisis exacerbated by derivatives trading. Frank, a Massachusetts Democrat who rose through the ranks in Congress fighting homelessness and advocating for gay and consumer rights, found his handiwork panned by administration officials after he released draft legislation last week that they criticized as too friendly to business. Frank’s bill allows for no change in how standardized over-the-counter derivatives are traded as long as they are reported to regulators. Commodity Futures Trading Commission Chairman Gary Gensler and Henry T.C. Hu of the Securities and Exchange Commission said Frank’s “discussion draft” created too many loopholes and had the potential to exclude all hedge funds and corporate end-users from oversight. The change could protect billions of dollars in profit for the dealers. When securities or derivatives are traded on exchanges -- where investors can see real-time prices, rather than indicative prices sent by e-mail in the over-the-counter market -- it can shrink the amount that dealers make on each trade, known as the spread. “Having more discretion for the dealers in the regulations gives an extra benefit to them by staying away from narrower spreads,” said Darrell Duffie, a finance professor at Stanford University in California. The top five U.S. commercial banks, including JPMorgan, Goldman Sachs and Bank of America Corp., were on track through the second quarter to earn more than $35 billion this year trading unregulated derivative contracts, according to a review of company filings with the Federal Reserve and people familiar with the banks’ income sources. The banks are arguing that an exchange or trading-system mandate that publicizes large trades could make it too expensive or impossible to execute customer orders and hedge those trades at the same time, according to the people familiar. Publicized large orders may dry up the willingness of dealers and investors to buy or sell contracts, they said. That argument might not get a sympathetic ear at the Commodity Futures Trading Commission. Its chairman has several times called the regulated platforms “electronic trading systems,” suggesting that U.S. officials may seek to require banks and investors to use them like exchanges with real-time, public pricing. “People viewed it as tantamount to an exchange,” said Robert Pickel, chief executive officer of the International Swaps and Derivatives Association, a New York-based group that sets standards in OTC derivatives markets. While the concerns were raised through both Republicans and Democrats, “the New Democrats have played a central role here both in terms of interacting with the end-users but also being able to take that concern to Chairman Frank,” Pickel said. A half dozen New Democrats pressed Treasury Secretary Timothy Geithner to expand the administration’s exemption for end-users in an Oct. 1 meeting. “We got into the weeds on the derivatives bill,” said Connecticut Representative James Himes, a former investment banker at Goldman Sachs and a member of the New Democrats, who attended the meeting along with McMahon, Bean and chairman Joseph Crowley of New York. Unlike Obama’s plan, Frank’s bill doesn’t require derivatives users or dealers to execute standardized over-the- counter contracts on a regulated exchange or trading platform, which would force greater price transparency. Instead, it gives them the option to decide if they want to use an exchange or a trading platform, or merely report the transaction to regulators by the end of the day. “We’ve seen a steady parade of all of the big dealers, all of the major money-center banks have come through Congress,” Himes said in an interview. In other words, the big banks are not going to let any real changes get passed. They don’t want limits or regulations, and they don’t want exchanges because they have the world’s largest market for debt cornered and they want to keep it that way. This next article, out on the same day, describes how regulating derivatives WILL reduce “sorely needed liquidity.” No duh, too much “liquidity” (in the form of debt) has been and is the problem – yet they are fighting for more (and Barney Fife, err, I mean Barney Frank, is sure to give it to them, just like he gave them more access to FNM and FRE! Oct. 9 (Bloomberg) -- Proposals to regulate privately negotiated derivatives may reduce “sorely needed liquidity” in the high-yield, high-risk loan market, according to the Loan Syndications and Trade Association. 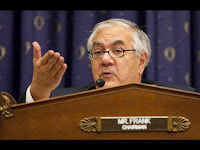 Draft legislation introduced on Oct. 2 by U.S. House Financial Services Committee Chairman Barney Frank may increase capital charges tied to derivatives known as total-return swaps, the LSTA said today in a weekly note to the 296 institutions among its membership. The swaps enable banks to pass on returns or losses from a pool of loans to investors. “Derivatives reform is complex, maddening and esoteric - and is also quite important to the loan market,” the New York- based trade association wrote. The draft House bill would direct bank regulators to require the firms to hold capital protecting derivatives trades from losses. Lawmakers should revise the draft to instruct regulators to set capital charges based on historic or predicted losses, Dave Hall, chief operating officer of Chatham Financial Corp. said in prepared remarks to the committee on Oct. 7. The charges should not be “a penalty to discourage the use of OTC derivatives,” Hall said. Of course having any capital requirements at all for derivatives is heresy to the central bankers! That would limit their profits! It would also mean that companies like AIG couldn’t write endless amounts of contracts with no money behind them in the event they are on the losing end. The current system is like a homeless, penniless man walking into a casino and using a multi-million dollar line of credit to gamble - if he wins he gets to keep the winnings and if he losses, oh well! There’s currently no difference between him and what AIG did other than the government will bail AIG out. Oct. 10 (Bloomberg) -- House Democrats offered new proposals to regulate the $592 trillion over-the-counter derivatives market after Obama administration officials said an earlier plan left loopholes. Representative Collin Peterson, head of the Agriculture Committee, presented his draft legislation yesterday. 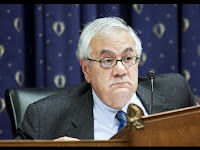 Hours later, Representative Barney Frank, chairman of the House Financial Services Committee, circulated among colleagues changes he had promised in an effort to “tighten up” the plan he announced a week ago. President Barack Obama’s administration proposed regulatory changes in August, including imposing higher capital and margin requirements on derivatives markets and requiring certain contracts be processed through clearinghouses. The legislative proposals laid out yesterday hewed more closely to the overhaul sought by the administration than did the draft Frank offered on Oct. 2. “Some of the perceived loopholes in the Frank bill, it looks like Peterson plugged a number of those up,” said Kevin McPartland, a senior analyst in New York at Tabb Group, a financial-market research and advisory firm, in an interview. Maneuvering over the legislation is a test of the administration’s call to tighten regulation in an effort to prevent a repeat of the global financial crisis. Opaque financial products, including derivatives, have contributed to almost $1.6 trillion in writedowns and losses at the world’s biggest banks, brokers and insurers since the start of 2007, according to data compiled by Bloomberg. House lawmakers say they are trying to protect so-called end-users, corporations that rely on derivatives to hedge everyday operational risks, such as fluctuations in foreign currency rates, interest rates and commodity prices. The Obama plan would subject companies to higher collateral requirements whether they trade standardized or customized contracts. Frank’s original proposal would exclude companies if they use derivatives to hedge risk. Gary Gensler, chairman of the Commodity Futures Trading Commission, told lawmakers Oct. 7 that the provision could free from oversight all hedge funds and corporations that use derivatives, including mortgage-finance companies Fannie Mae and Freddie Mac. The revised draft that Frank, a Massachusetts Democrat, circulated among colleagues and staff at the Capitol would continue to exclude most corporations that use derivatives to mitigate operational risk. In the new version, derivatives users that are large enough to “expose counterparties to significant credit losses” wouldn’t be eligible for the exclusion. Peterson’s measure would exempt all except the largest end- users from new disclosure, collateral and clearing requirements. Peterson, a Minnesota Democrat, gave Gensler much of what he asked for in an Aug. 17 letter to lawmakers, including tougher execution requirements for standard contracts and the authority to regulate over-the-counter foreign currency swaps. Oct. 12 (Bloomberg) -- Large banks should be banned from trading derivatives including credit default swaps, said Joseph Stiglitz, the Nobel prize-winning economist. The CDS positions held by the five largest banks posed “significant risk” to the financial system, Stiglitz said at a press conference in Brussels. Big banks should have extra restrictions placed on them, including a ban on derivative trading, because of the risk that they would need government money if they fail, he said in a speech today. Derivative trading and excessive risk-taking are blamed for helping to spark the worst financial crisis since World War II. American International Group Inc., once the world’s largest insurer, needed about $180 billion of government money after its derivative trades faltered and pushed the company toward bankruptcy. 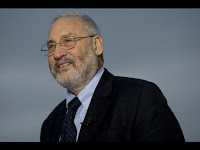 Financial markets should be subject to taxes that will discourage “dysfunctional” trading and help pay for the effects that the global crisis had on poorer nations, Stiglitz said last week. U.S. and European regulators have pushed for tighter regulation of the $592 trillion over-the-counter derivatives market, amid concerns that it could create systemic failures in the financial system. Lawmakers have called for global rules covering derivatives to prevent financial institutions from exploiting jurisdictional differences in regulation. Former German finance minister Hans Eichel said in an interview today that global regulation would ultimately be needed. The European Union should enforce tougher legislation, even if the U.K. is reluctant to adopt stricter standards, he said. “The Eurozone is strong enough economically to go it alone,” Eichel said. European legislation could then become the blueprint for global rules, said Eichel. Stiglitz is right, but even he doesn’t go far enough. There is almost no useful purpose for derivatives in our society, in fact they almost all work against society and thus should not be allowed… at all, and especially for Cap & Trade. Yes, this would mean deleveraging and that is exactly what needs to happen to return to a sane world of finance. One argument for derivatives goes that they make doing trade easier… for example, the company that does business with another large company, say to transport their goods, might “cover” or “hedge” a large contract with credit default swaps that would pay off if the company they are doing business with should go under, thus reducing their risk! What they fail to realize is that the company they are buying this “insurance” from is not regulated and has no assets to back up the “insurance” they are selling! Thus it’s a FALSE SENSE OF SECURITY, and in fact it produces a systemic risk and is a moral hazard to boot! How about this… if they need insurance, buy insurance from a real and regulated insurance company? Or, how about this… if they are doing business with marginal companies, perhaps they should spend more energy getting to know who they are doing business with and assess their economic condition PRIOR TO entering into business with them! How quaint, I know! They will kick, and scream, and argue, and sadly it’s true that nothing will happen to end their fraud… that’s because they create money from nothing but cut the politicians in on their schemes at the exclusion of everybody else. What’s happening in this “shadow banking” world is extremely important. It’s the reason most economists and supposed experts have been wrong about the economy and markets and it’s why they will be wrong going into the future. The world of derivatives, despite kicking and clawing, is getting smaller. That’s because the limits of the exponential math were reached. 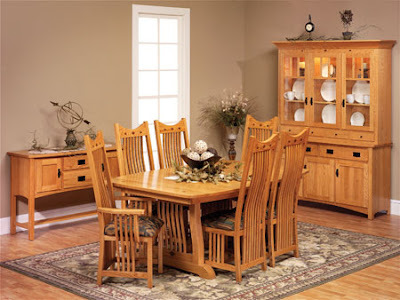 They were so good and so fast at pulling everyone’s future earnings into the here and now, that they quickly reached the point that incomes can no longer support the debts. And now that they have the government using your money to keep the bankers going, the government is likewise now in an impossible math situation where future income cannot possibly pay back current debts. Devaluing the dollar will not work, there is no solution other than to do the right things – shrink the size of government, reduce spending and work to balance the budget. How do we accomplish that in reality? It’s going to take some serious event, that’s for sure – I’d sure like to see the end result be the separation of corporations and their money from state. It would be a lot easier to say “NO” to the banksters when your job doesn’t depend upon it! Derivatives were engineered by people desperate to keep never ending credit growth on a growth path. Cap and Trade is invented by the same desperate types born in the same paper shuffling non-productive industry.